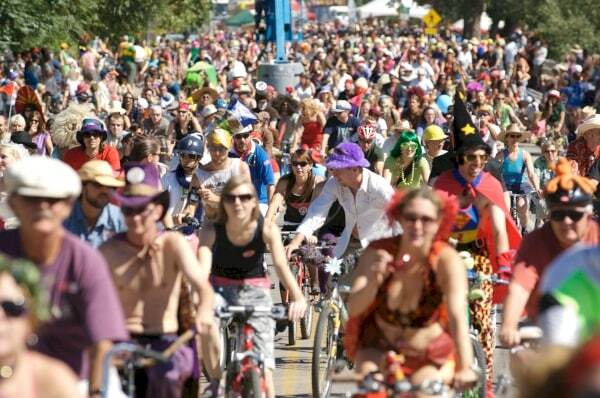 NEXT SATURDAY, June 16th, The New Belgium Brewing Company, makers of Fat Tire Ale, and WABA are hosting the biggest, most fanciful, bicycle celebration of all time. And for the first time ever it’s coming to DC! We’re going to celebrate bikes, make some new friends, and sip on a couple of cold, Rocky Mountain barley pops–all in the name of local bike advocacy! The Tour de Fat benefits WABA, MORE (Mid-Atlantic Offroad Enthusiasts), Black Women Bike DC, and FABB (Fairfax Advocates for Better Bicycling). Before the big day we want to make sure you know all the event details so that you and your friends come prepared, because a) you can’t miss this, and b) you must come prepared. WITH OLD FRIENDS: By bicycle, of course! The Yards park is located at 10 Water St. SE, Washington, DC near the National’s Stadium. . For those traveling from far and away, it is advised that you find parking far from Yards Park. Parking in the area will be extremely limited due to the Yankees/National’s baseball game. WITH NEW FRIENDS: A number of local shops and organizations are leading convoy rides down to the park. We will update this list as convoy information becomes available. For those who’ve never participated, this is indeed a COSTUME AFFAIR. Costumes are enthusiastically encouraged!! 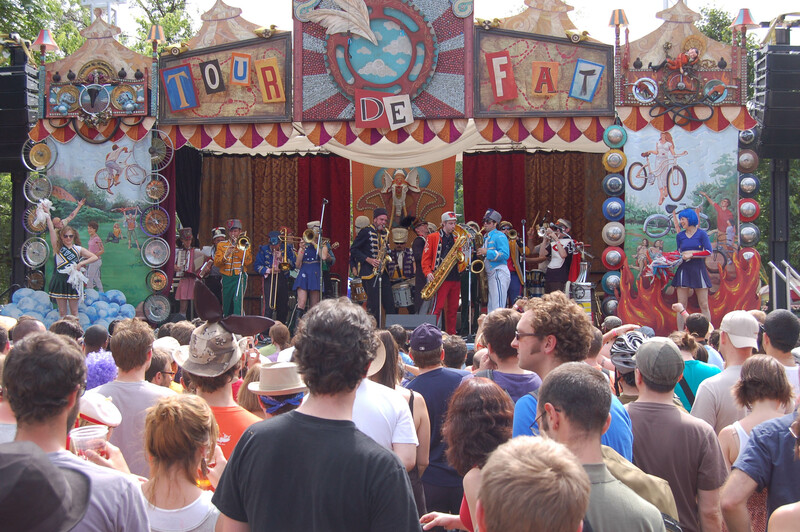 For some inspiration, check out this montage of photos from Tour de Fat’s of yore. FREE BIKE VALET:No need to bring your heavy U-lock, the folks at MORE are providing safe and secure bike parking all day long. GAMES: We don’t want to giveaway all the surprises, but we heard for one of the games, New Belgium’s creative genius’ constructed life-size Jenga. Yes, life-size. 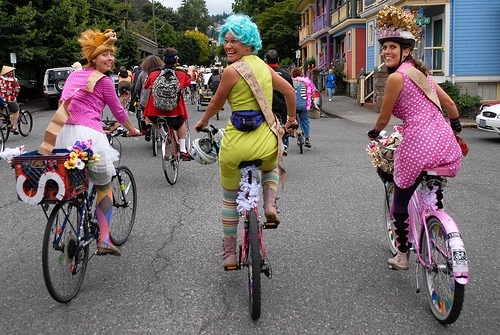 BIKE PIT: Imagine if instead of creating candy, Willy Wonka created bicycles. PERFORMANCES: Le Tigre’s whimsical ways will woo us all day long. Start mixing up your papier-mâché pulp, pull out that tutu from your college years, give your bike a quick tune-up, and invite your friends to the biggest bike festival DC has ever seen. Topics: Uncategorized. Tags: DC, events, FABB, Fairfax County, fundraising, news, Prince George's County, Tour de Fat, valet, Virginia. Previous Traveling this Summer & Wanting to Rent a Bike? WABA Partner RentaBikeNow.com Can Help!